In support of Vernon Davis Foundation for the Arts. 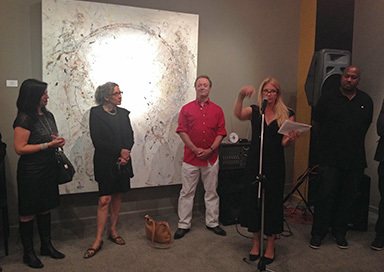 Left to right: Eric of Gallery 85, Patrick, Director of Gallery 85, Sandy of Gallery 85, artist Carrie Ann Plank, artist Deborah Trilling, Lou Bermingham, Melissa of Gallery 85 (speaking), artist Milton Bowens, artist David Ogle, artist Kristin Lindseth, and artist George Rivera (partly obscured by camera). 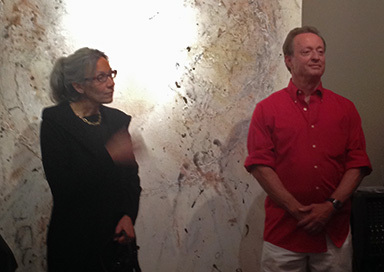 Left to right: Artists Carrie Ann Plank, Deborah Trilling, Lou Bermingham, and Melissa of Gallery 85, speaking, artist Milton Bowens in front of Lou's painting "Osiris." Artists Deborah Trilling and Lou Bermingham.